I have known Ryan for 4 years. I met him at his place of business where I was referred by another customer that recommended him highly. I have been doing business with him since. He has worked on several different types of vehicles for me. The work has always been professional and the price was fair for a job well done. His honesty and integrity will keep customers coming back to him. Our family has two Ford Powerstroke pickup trucks, a Hummer H-2 and a Lincoln Continental serviced by Wimberley Automotive. In our opinion, Ryan Whitman (Owner) is the best automotive expert that we have ever had service our vehicles, including dealer service departments. They consistently meet or beat their estimate of delivery time for completion of repairs and the cost of service is substantially less than dealer service costs. We highly recommend Wimberley Automotive for service or repair of any vehicle. Ryan, just wanted to let you know how much I appreciate the manner in which you handle my business. For the past 10 years we have been doing business together, you have helped me keep my 1999 Ford F250 running and have been able to put over 314,000 miles on it. You have always been above board in your repairs by letting me know what it would cost after you do the diagnostic. I have always appreciated that and I am sure you do the same with all your customers...You have done such an excellent job that I recommend you as often as I can and my brother, who lives in Winters, Tx. And my nephew who lives in Midland, Tx. bring their vehicles to you for repair. It is truly satisfying to know we have people in Wimberley like you to depend on for our automotive repairs. If you want the job done right, and on time, this is the place for you! Wimberley Automotive has been taking care of my vehicles and my company's fleet for years. The service is great, fast and won't cost you an arm and a leg. You can feel right away that the staff there love what they do, and they put their passion into each vehicle that goes into that garage. I recently had my brakes done here. Not only did they do the job right, but they went the extra mile to show me where the previous brake service was not completed correctly, and what I needed to fix it. Way cheaper than the dealer but much greater service. Local friendly shop that always takes good care of me in a fast and professional manner. 5/5 stars from me! If you don't want to waste your time and money, this is the place for you. 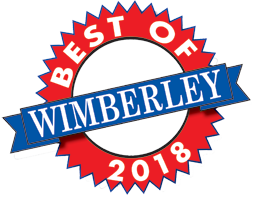 We were voted Best Automotive Repair Shop in Wimberley for 2018! Thank you!